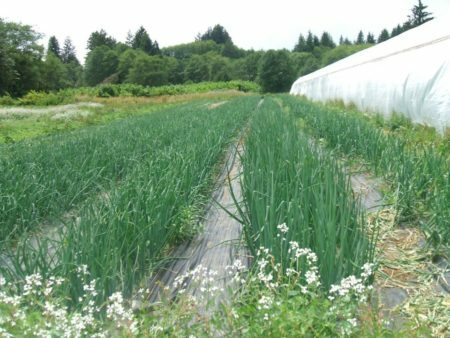 Kingfisher Farm has been farming on the North Oregon coast for over 25 years and grows over 50 different varieties of vegetables per annum. We specialize in rare and heirloom varieties as well as many varieties of the “common” vegetable. You can find us at farmers markets from Manzanita to Astoria. We are showcased on the menus of the finest chefs in Portland and the Oregon coast and have the longest running CSA on the north coast! And now we are expanding our CSA embrace to include our Portland city folk as well! CSA is an acronym of Community Supported Agriculture and based on an ancient community practice of providing your local farmer with the means to grow the vegetables and fruit you (and your family and friends) will eat that season. Our members buy a share of the farm in late Winter to early Spring. We use these funds for buying fertilizer, soil amendments, seed, and paying for labor and other necessaries. Then in the growing season we deliver a generous weekly box of gorgeous, healthy & organic bounty to our beloved farm members. An incredible value for the abundant diversity found in the box. A veritable treasure chest!